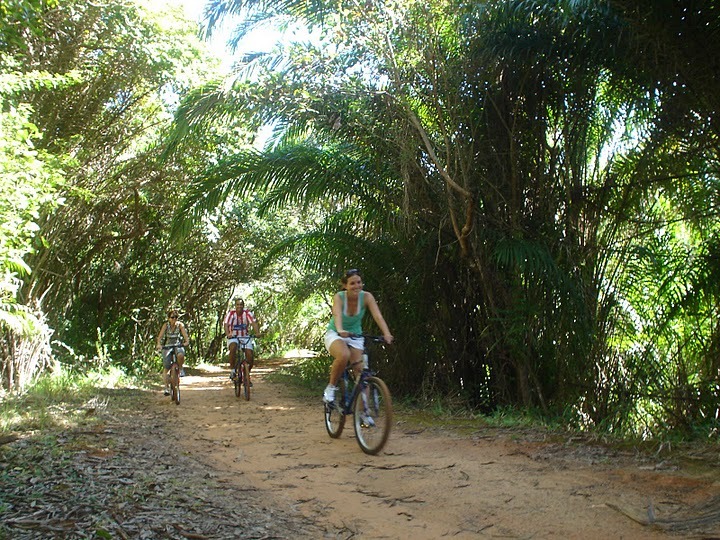 Victoria Broadus, the newest full-time blogger for TheCityFix, takes a bike ride through a city park in Salvador, Brazil. Photo courtesy of Victoria Broadus. Hello, hola, oi! And thanks for checking out my first blog post with TheCityFix. I joined EMBARQ, the producer of this blog, after spending the last year in Brazil and India. In Brazil I was mostly learning Portuguese, teaching English, and trying to see as much as I could of the country. In India I worked with a Bangalore-based think tank – Center for Study of Science, Technology, and Policy – on issues such as transportation innovation in developing cities, sustainable mobility and pro-poor sustainable development. Before Brazil and India, I studied politics and international studies at Brandeis University, and after a semester at University of Havana, I began to focus on politics and development in Latin American countries. I graduated in 2005 and moved to Monteverde, Costa Rica, where I worked for two years with the Monteverde Conservation League. From 2007-2009 I earned a master’s degree in Latin American studies and political economy at Georgetown University, where I was lucky to have phenomenal Portuguese professors who inspired me to focus more closely on Brazil. So, that’s the path that has brought me to EMBARQ. My interest in sustainable urban mobility in particular grew deeper over the past year, as I sat in messy traffic in cities in northeastern Brazil and studied the contrast with southern cities like Curitiba and Porto Alegre, and of course in Bangalore, where it’s impossible not to go crazy after just a day of trying to get around the city. Thinking about a daily commute in Bangalore conjures memories of bumping along rutted roads in polluting auto-rickshaws with belligerent drivers, covering my face with a scarf to try to keep out the fumes; watching pedestrians attempt to maneuver through chaotic streets since there are almost no functioning sidewalks to speak of; staring at the ground while walking to avoid plunging into one of many gaping holes; and getting in multiple accidents – fortunately not too serious – along the way. This experience helped me appreciate how essential sustainable urban transportation options are to improving people’s quality of life. And I want to focus in particular on how sustainable transportation development can be pro-poor. For instance, how bus rapid transit systems or new metro systems make cities’ economic centers more accessible to poor peripheral neighborhoods – or keep these peripheral areas cut off because they don’t reach them or are too expensive for people to use. I also plan on following sustainable mobility developments in Brazilian cities preparing for the World Cup in 2014, and Rio’s preparation for the Olympics in 2016. Also, please email me with your ideas for TheCityFix, and comment frequently on my posts! From Los Angeles to Cape Town, a New Blogger Arrives in D.C.
Greetings from a New Blogger!